that have sickened more than 400 people across the country in an outbreak have been linked to packaged salad greens. These products have been linked to many outbreaks over the years. In fact, a study conducted by the Centers for Disease Control and Prevention (CDC), released in January of this year, said that leafy greens were responsible for the majority of foodborne illness outbreaks from 1998 to 2008. Last year, the seventh largest food poisoning outbreak in the U.S. was linked to a spinach and spring mix. In the story Fear of Fresh, from the Center for Science in the Public Interest, researchers state that greens packaged in bags may be causing more foodborne outbreaks, because there are ingredients from many different plants packaged into one bag. And those ingredients can come from many different sources. Any bacteria, viruses, or parasites on one leaf of lettuce or carrot shred would be “all over the leaves in the bag by the end of the distribution chain,” according to Robert Tauxe, who was Acting Deputy Director of the Division of Foodborne, Bacterial, and Mycotic Diseases at the CDC at the time of the interview. Contamination can come from just about anywhere, from wild animals to farm runoff to an ill food handler. Some farms that grow lettuce and spinach are close to feedlots and cow pastures, which makes them susceptible to contamination from feces runoff. Even washing produce won’t necessarily get rid of all pathogens. Bacteria, for instance, is very sticky and is very hard to wash off greens, for instance, because of their delicate nature and crenelated surfaces. In apples, for instance, bacteria can get into the fruit through the core, so washing it, even before you cut or peel it, won’t help. In the current outbreak more than 400 people in 16 states and New York City are sick. And at least 22 people have been hospitalized. 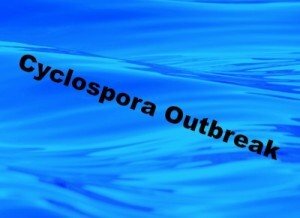 The symptoms of a Cyclospora infection include watery diarrhea that can last for two months, loss of appetite, weight loss, stomach cramps, nausea, and vomiting. If you develop persistent diarrhea that lasts for days or recurs, see your doctor. The test for Cyclospora has to be requested by your doctor, since it is not commonly performed.